************* Now revised and enhanced ************ These worksheets are tailored for Grade 1 , 2 and Kindergarten kids. It's a set of 22 worksheets and activities covering the following topics 1. Food for Animals 2. Uses of Farm Animals 3. Animal Sounds 4. Baby Animals 5. Nocturnal Animals 6. Students will be able to cut out words to glue and label the parts of an insect. This worksheet is in black and white to save on ink. It could be used as an assessment for a unit on insects or as a reinforce. Perfect for early elementary and special education. 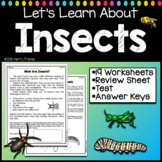 Portuguese Insects Worksheet Packet for beginning Portuguese classes. This packet contains three worksheets; a Vocabulary Worksheet, a Word Search Worksheet and a Word Scramble Worksheet. These activities are an easy way for students to begin learning the common insects in the Portuguese vocabulary. Chinese character on a worksheet. Students can color the page while learning the Chinese character for insect. I did not draw the insects. 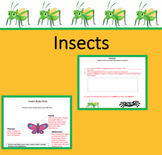 Complete the worksheet about insects the students find interesting. Story questions that go with the story, Spiders Are Not Insects Louisianan Comp. Curr. 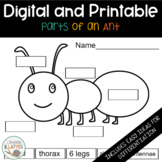 Label the body parts of an insect and add more body parts like the antennae, legs, etc. Count, sort, and color with insects. Also available in Word for edits.